While Kate Wilkinson has resigned as Labour Minister, it is clear from the Royal Commission Pike River report that the contributing factors were (a) rooted in legislative changes made 20 years ago, and perpetuated under governments led by National and Labour and (b) that New Zealand’s health and safety problems in the workplace extend far beyond the mining industry. That is why the crucial proposal in the Royal Commission report is the setting up of a stand-alone Crown entity that would be dedicated to improving health and safety, across all industry sectors. So far, this has been the only recommendation on which the Key government is dragging its feet. The government wants more time to consider the proposal. That being the case, you would think the need for sweeping change would be immediately embraced – yet to date, Key has given little indication that the changes he is setting in train will be systematic. Instead, they seem focussed on shoring up the safety situation in mining, and only in mining. How and when does Key propose to address the pervasive “ low touch high trust” regulatory culture that continues to kill and to injure workers in agriculture, in forestry, in manufacturing via the unsafe use of equipment, on quad bikes etc etc? In that respect, the government wanting more time to consider the need for a stand-alone Crown agency dedicated to health and safety sounds uncomfortably like the Pike River management wanting more time to comply with the DoL request to build a second egress from the mine. (The explosion on November 19, 2010 intervened before those vague promises could be met.) Ultimately, the sea change needed in our health and safety culture will depend on changing the priorities contained in the Heath, Safety and Employment Act of 1992 – that put the onus for health and safety onto the employer. Unfortunately the Department of Labour then stepped back and allowed the employers’ needs (for profit and competitive advantage) to set the regulatory climate. Low touch, high trust, and high rates of harm to workers became the norm. In the process, the Dol’s in house expertise and institutional knowledge withered away. Unless and until that situation is revisited, the changes will only be cosmetic. One has to ask – is locating the DoL and its threadbare workplace inspectorate within a super ministry that is dedicated to lifting economic outputs likely to mean that health and safety issues get treated as a top level priority ? Hardly. They are far more likely to be seen as a hindrance to economic growth. Evidently, the Royal Commission realised this danger. That’s why they felt that only a new, stand alone Crown entity would create the independence and generate the momentum needed for a fresh start. Key is now mulling over whether to follow the Royal Commission’s advice, or to subvert it. To make an obvious point – the business culture and regulatory mindset that has made our workplace health and safety record among the worst in the developed world needs to be understood, before it can be fixed. Australian workers not only get paid more, on average. New Zealand workers are also, on average, more at risk of harm in the work place than their equivalents across the Tasman. Both trends can be traced back to legislation that was passed here in the early 1990s. Not for nothing did New Zealand politicians at the time describe our main piece of health and safety law (ie, the Health Safety and Employment Act 1992) as being a “brother” piece of legislation to the Employment Contracts Act. The ECA assisted employers to bypass union representation and cut the short-term cost of labour. In similar fashion, the HSE Act has sought to liberate employers from the former, more intrusive system of centralised workplace inspection and regulation, and to promote in its place a ‘safety culture’ based largely on voluntary compliance. As a consequence, there has also been a very relevant structural change. As union membership lapsed, New Zealand work sites began to atomise into a welter of contractors and sub-contractors, each with their own alleged responsibilities for a health and safety regime that tended to exist more on paper than in practice. In the current climate of price competition between independent contractors, health and safety elements are usually among the first budgeted items to get trimmed in order to win bids for the work available – while at the other end of the spectrum, the DoL’s inspection and enforcement regime has been gradually drained of resources and technical expertise, in line with the preference for “light handed” regulation and largely voluntary compliance. Thankfully, the Pike River Royal Commission has heavily criticised this ‘light-handed’ regulatory culture that has prevailed within Department of Labour for the past two decades. Not only did the DoL scrap its mining inspectorate almost entirely in the late 1990s, but the in-house technical expertise that was relevant to a variety of health and safety concerns has been allowed to deteriorate and/or be outsourced. The same thinking that produced the ECA shaped the HSE Act. (To be precise, our HSE Act was heavily influenced by the 1972 Robens Report in Britain, which was the first major report to champion employer self regulation of workplace safety. Essentially, our thinking on health and safety is at least 40 years old!) The advocates of both these pieces of early 1990s legislation have tended to demonise centralised oversight and regulation (and significant on-site union representation) as being obstacles to the ability of business to increase productivity, reduce labour costs and maximise efficiency and profit. To meet those goals, New Zealand has paid a price in blood. To address the current situation adequately, New Zealand not only needs to jettison the ‘low touch, high trust” model and to re-introduce regulatory oversight. We will also need to retrain a whole new generation of inspectors, and rebuild DoL’s lost expertise. Even with the best goodwill in the world, it will take a generation to repair the damage done by our neo-liberal experiment in workplace safety. The risks to health and safety that have gone hand in hand with the atomisation of the workplace also need to be recognised. The various attacks by the Key government on collective bargaining – not to mention the changes made to the employment law governing the film industry in the wake of The Hobbit dispute two years ago – are making proper health and safety provisions and oversight harder, not easier, to put into practice. Until employment legislation is automatically vetted for its health and safety implications –which is something a stand-alone Crown entity could be tasked with doing – this situation will not change. We will continue to pass employment laws that directly, and indirectly, endanger workers. 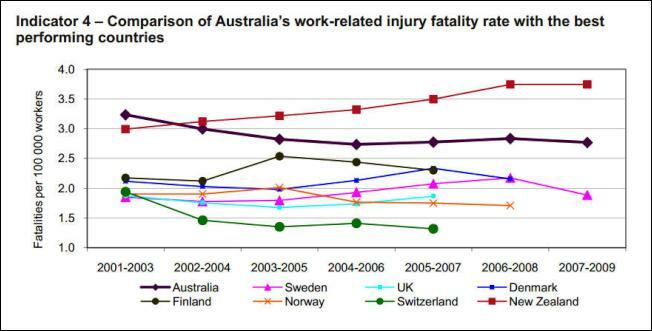 Finally, the incidence of fatalities is not the only measure of workplace safety. The annual DoL figures do not include deaths in the maritime or aviation sectors, nor fatalities due to work-related road crashes. The DoL figures also do not include the toll from occupational disease, which is estimated to lead to 700-1,000 fatalities and 17,000- 20,000 new and serious cases a year with asthma, skin diseases and asbestos-related cancer being the major contributors. 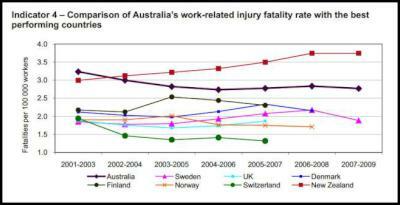 There are other ways of measuring the high incidence of accidents and injury in the New Zealand work place. During 2010, 187,300 New Zealanders lodged ACC claims for work-related injuries, comprising 209,700 claims in all. Just over 10% of these claims fell into the more serious “entitlement claim” category, where compensation and support goes beyond merely the re-imbursement of medical fees. Agricultural and fisheries workers were the occupational group with the highest injury incidence rate. On the figures, a startling rate of almost one in four farming and fishery workers were injured on the job in 2010, as reflected in the incidence rate of 241 work-related injury claims per 1,000 full-time equivalent employees. Despite fewer ACC work related claims being lodged annually since 2006, the cost of such claims has continued on a steady rise. This is due either (or both) to a rise in medical costs, or to an increase in the severity of the accidents – along with the distinct possibility that the number of ACC claims lodged may have dropped not because of safety improvements, but in response to ACC raising the hurdle of acceptance. Clearly then, the systemic problem extends beyond Pike River, and the mining industry. For that reason, so must the solutions. At the very least, Key has to be held to a timetable for his government’s pending decision about the establishment of a stand-alone Crown entity to promote workplace safety.